Removing markers can be as risky of a venture as apply them. Any time a worker must walk on the road surface, it can be dangerous. The patent pending marker remover TPM 2200 is so safe and simple to use that it only takes one worker. The truck can stay in the desired lane, as the machine works from either side of the truck. This RAM will also save lives and labor through automation. Whether you want to cut the tops off markers or pull them entirely from the road surface, the TPM 2200 Marker Remover is easy to operate. All you have to do is 1. 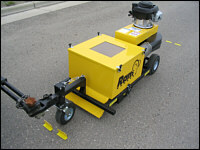 Attach the TPM 2200 to any truck with a receiver hitch and a 2″ coupler, 2. Start the easy pull engine, 3. Get into the truck, 4. Drive over tabs to be cut or pulled, 5. Stop periodically to empty the collection bin, 6. Finish the job in much less time with much less risk. A simple blade change converts the machine from cutting mode to pulling mode. The Marker Remover TPM 2200 has many features that make it both safe and efficient. It removes reflective markers without the worker having to walk on the road. This is not only safer for your employees, but considerably faster. Get a RAM and get off the road! Cutting blades or pulling blades. Removable collection bin for cut/pulled tabs. TPM 2200 can be placed on either side of truck. Truck can stay safely in the desired lane. Only needs a driver to pull unit and empty collection box. Cuts to ½” from surface, or pulls markers from surface completely. Much faster than manual removal, up to 5 mph. Vacuums up scrap marker pieces and pulled markers. Easy disposal of marker pieces from machine. The capabilities of the RAM marking system have expanded to include half track markers and raised markers. This option has dramatically expanded the uses and versatility of these innovative products. For optimal operation, we recommend Bunzl collated markers. Q. Do I need a special truck to use the TPM 2200? A. No. Any truck with a standard 2″ receiver type hitch will work for towing the TMP 2200. Q. Are the replacement blades expensive? A. No. The TPM 2200 uses utility knife blades that can be purchased through your distributor. Q. How often do the blades need to be changed? A. Depending on the road surface and cleanliness of the marker, some blades have lasted for up to three miles. Spacing and density of marker placement also affect blade life. Q. What kind of power source do I need to run the TPM 2200? A. The TPM 2200 is powered by a Honda gas engine. There is no external power source needed. Q. What if I need to remove the entire tab from the road instead of cutting it off? A. The TPM 2200 comes with a simple tooling change that allows you to pull the tabs off the road if needed. Q. Will the TPM 2200 run in extreme heat/cold? A. There are no known temperature limitations of the TPM 2200. Q. Can one person load and unload the TPM 2200 from the truck bed? A. If a winch and ramps are used, one person can load and unload the TPM 2200. Otherwise, a minimum of two people would be required.